We ran out today on the Boss Lady looking for anything that would bite. We started the day in 50 fathoms inside the Wilmington on a .5 degree temperature break and a lot of birds. 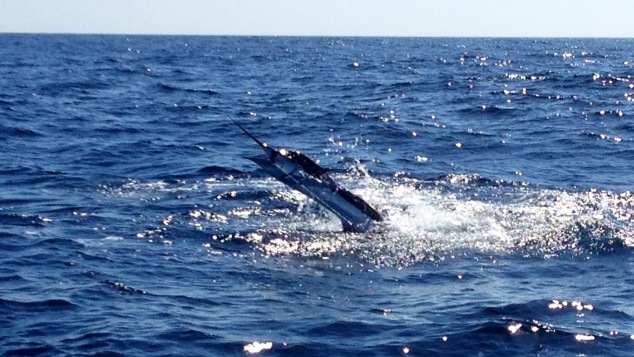 It wasn’t long before a white marlin came up and ate a naked ballyhoo on the left long. After an awesome aerial display we got a clean release. We got the lines back in quickly and had another white come up behind the teaser for a look but never ate. We also managed to put two Mahi in the box then things slowed down. We made out way out to the West Wall of the Canyon and marked a lot of bait all day but couldn’t get a bite. Finally we get whacked by a big blue (easy 500 plus pounds) that dumped a 50W. We chased the fish for awhile before it made an erratic turn and got caught on the running gear. That was a heartbreaker, and the remainder of the day brought no better luck as we didn’t get another bite. I mated on the 58 foot custom boat “Lizanne” for the MA500. It was a last minute setup, but I was stoked to be in the tournament. Day1: we ran to the blue water in the Wilmington Canyon and had a solid day of fishing. 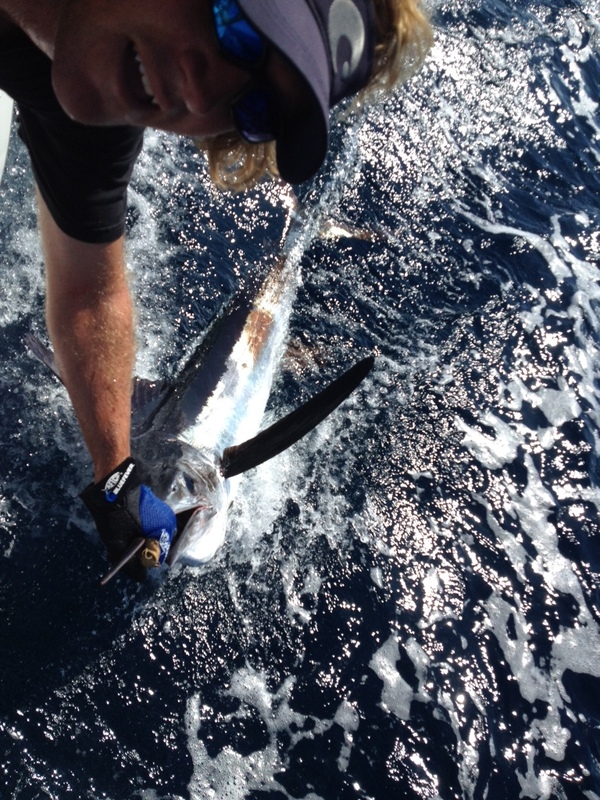 We went 3/5 on white marlin, 2/2 on sailfish, and 0/1 on blue marlin. 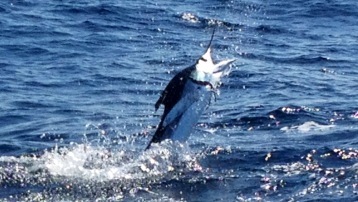 The Blue was about 300 pounds and ate a MoldCraft SuperChugger off of the left short rigger. Unfortunately it didn’t stay connected. There was a phenomenal BigEye Tuna bite in the East Notch of the Canyon. Day 2: we ran back hoping to find more action, but only had one white marlin come up on the teaser and pulled off a small blue marlin. We wound up pulling plugs for half the day tryin to find a big blue marlin. Day 3: Captain Jon Ball ran the Lizanne towards the Baltimore Canyon, and we found a half degree temperature break in 35 fathoms with a lot of scattered weed in the water. We started off with our white marlin spread and just had so much grass it was too difficult to fish. We pushed out toward the canyon and switched over to pulling plugs again, but couldn’t get a bite all day. It is always fun being a part of a tournament, and I had a lot of fun getting to know the crew on the Lizanne. Everyone one the boat was active and knew what to do which made it fun when we were on the fish. I Captained the 56′ Viking Nightwind for the Ladies Billfish Tournament. We ran through some storms on our way to the Lindenkohl Canyon. Our morning started with more storms dictating where I could go, but we managed to raise two whites and catch a 56# yellowfin tuna. It was sloppy weather all day, but we pushed on. We found a huge pod of pilot whales in the middle of the canyon, but there weren’t any fish under them. We worked the canyon hard and hit some pot balls hoping to dig up a Mahi, but no luck. I decided to push inshore a bit and then we found some whites. We raised a triple and got one of them. We got the lines back in and then got covered up with skipjack tunas. At that point tournament time was up and we had to leave. We wound up winning the Tuna category in the tournament with Roxy’s 56 pound yellowfin tuna which was her first tuna. I will be mating on the 58′ custom Intensity Boat called Lizanne for the Mid-Atlantic $500,000 this week. Hoping for a little luck. I ran out today with a good friend of mine on his 35 Viking, Reelality out of Cape May, NJ. We went out looking for marlin and started our day in 600 fathoms in the Baltimore Canyon. We found a solid stretch of a weedline in beautiful blue water and worked it most of the day. Our water temperature was 82-83 degrees all day. We picked at some dolphin and went 1/2 on whites. We started to push deeper but decided to work our way back in after we reached 800 fathoms and had nothing to work. We worked our way back in towards the West Wall of the Baltimore and ended our day. I found out that we were 5 miles short of the great white marlin action. Fun day, but bummin we were so close and never knew it. Just needed to be a little deeper. Well, the fish decided to keep their elusive trend going and we got no love from them today. We took the Boss Lady to the deep of the Spencer after hearing a good catch report off of a weedline there yesterday. The day started with a white marlin pulling the hook and another getting bill wrapped. Then we pushed north and found pilot whales and dolphins everywhere pushing schools of squid to the surface. I’ve seen this on overnighters but never during the day. It was amazing to watch, but there were no fish in the mix there. We ended to day trying to hit the lobster pot balls for dolphin in the Wilmington canyon which we were only able to pull two off of, one which went 20 pounds. The white marlin are here, and I’m hoping to get some trips to fish exclusively for them soon since double digit days are common right now.